"If you have little interest in the world of horses and read this book you will become interested. If you are already interested you will be enthralled". The fascinating new book by Dr. Robert Miller and co-author Rick Lamb (Host of the radio broadcast "The Horse Show"). They document the extraordinary events of the past quarter century which are changing the ancient art of horsemanship from training to riding, tack, medicine, and more. Most significant, they suggest that the communication skills involved in this remarkable change can be used to facilitate human relationships. There has been a change in how we treat our horses: We no longer "break" them to harness or saddle; we "gentle" them, so they become our partners, their natural grace and athleticism restored and enhanced through humane and thoughtful methods. The authors describe how the horse's mind works, how horses learn and how the psychological training methods of great horsemen past and present allow the rest of us to achieve extraordinary results with not only our horses but with ourselves. 'The Revolution in Horsemanship' is one of the most important equestrian publishing events of this decade, and is already being hailed as a classic in the field. large 8.5 in. x 11.0 in. format. 354 pages with hundreds of illustrations. Chapter 5 - Why Now? After graduation from Colorado State University, Dr. Miller settled in Thousand Oaks, California, where he founded the Conejo Valley Veterinary Clinic. Thirty-one years later, he retired as a renowned veterinarian and expert in ethology (the study of animal behavior). Dr. Miller has visited every continent giving lectures to colleges, conventions for animal groups, horse organizations, breed associations and other clients. He has received numerous professional awards for his involvement with equine associations, production of videotapes, and lecturing. He has authored several books, and his acute sense of humor and love of cartoons have provided seven veterinary cartoon books. Dr. Miller has been on the editorial staff of Veterinary Medicine, Modern Veterinary Practice, Veterinary Forum, and Western Horseman and other horse magazines. He is internationally known for his lectures and seminars. In 2004 Dr. Miller was named to the Hall of Fame by Western States Horse Expo. No one gets into horses to become a better human being or to find greater meaning in life or to make the world a better place, but sometimes that’s exactly what happens. In the beginning, you play with horses because it’s fun. It’s a pleasant diversion. Then you find that it feels good in a deeper and more lasting way than many other recreational past-times. You may love riding motorcycles, but your Harley doesn’t nicker at you in the morning. There is something very special about a horse that makes you want to do better with and for them. But just wanting it isn’t enough because this is something very different and very unnatural for us humans. It takes time and effort to learn to communicate effectively with a horse. You have to be willing to go back to school, to learn and to change the way you behave. You have to set your ego on the shelf and leave it there while you reinvent yourself as a horseman and, often, as a human being. This new person observes, remembers and compares. He listens more and talks less. He takes responsibility rather than assigning blame. He controls his emotions. He becomes aware of his body language. He tries to improve himself. He commits himself to acting justly. He cultivates patience. He forgives. He lives in the moment rather than stewing over the past or waiting for the future. And of course, he places the wants and needs of another living creature ahead of his own. It isn’t easy. We cannot wave a magic wand or drink a magic potion and change the nature of our species anymore than a leopard can change its spots. It takes work and lots of it. It takes willpower and persistence, focus and thought. In an age of mindless entertainment and instant gratification of our every physical and emotional craving, those don’t always come easy to us. But if we persist, the payoff makes it all worthwhile. The revolution in horsemanship has given us the motivation and means for meaningful self-improvement, and the world outside of the horse industry has taken notice. Major corporations, for example, are finding that they can inspire a different and better form of leadership, build stronger, more effective teams and foster a more enjoyable workplace by incorporating the principles of the revolution. Some of these corporations are coming to Monty Roberts for help. Roberts has crafted a message of trust-based management, using Join-Up® as a metaphor, and has delivered it to companies such as American Express, Johnson & Johnson, Dean Witter, Disney, Hallmark, Chevron, Pfizer, Volkswagen and John Deere. Educators, psychologists, children with autism, at-risk teens, victims and victimizers have also benefited from Roberts’ work. Clinician Frank Bell offers an all day, hands-on horsemanship course for corporate employees and clients as a means of developing concentration and focus to better prepare them for the challenges of the workplace. Interestingly, it was the work of legendary sales trainer Dale Carnegie (How to Win Friends and Influence People) that taught Bell the importance of making a good first impression and inspired his 7-step Safety System for preparing a horse to be ridden. Now he is using horsemanship to help people reach their full potential, bringing him full circle. The horse is truly a vehicle for not only transporting but also elevating the human species, for taking us closer to that elusive goal of realizing human potential. That potential is different for each of us. Some are born with every advantage. They have healthy bodies and minds, healthy home environments in which to grow and go through life without many real setbacks. For such people, the possibilities are practically endless. Other people are burdened with tremendous disadvantages from birth, spiral out of control through poor life choices or suffer debilitating injuries. What the horse can mean for them is perhaps even more astounding. For example, two decades ago, one of the authors met an intelligent and articulate young woman – we’ll call her Terri – who had very little function below her neck. A rare neurological disease had robbed her of control of most of her body. Although she had partial use of one hand, she was, for all intents and purposes, a quadriplegic. Terri was the founder of an Oregon therapeutic riding organization. She loved horses and refused to let her condition stand in the way of her own riding. With perseverance, Terri acquired a special saddle with extra back support and a harness system to hold her in place. She found a horse that was gentle and would take care of her. And she started riding, first in an arena, then outside. At five months of age, Bridget McGrath was diagnosed with infantile spasms, a seizure disorder. The condition was stabilized with medication and a program of physical therapy was started in the hope that she would someday be able to walk. By the age of two, still unable to stand, Bridgette seemed to stop trying. Equine-Assisted Therapy at the Somerset Hills Handicapped Riding Center in New Jersey made the difference. Within six months, Bridget could sit straight up in the saddle, with the help of volunteers, and grab a Hula-Hoop while trotting. Then speech therapy began. At three, she spoke her first words and today, at seven, she runs to the stables, calling her horse’s name. The value of horses and riding for disabled individuals has been recognized for centuries. The ancient Greeks used horseback rides to cheer the spirits of those considered untreatable or incurable. An 1875 study in Paris concluded that riding could lead to improvements in posture, balance, joint movement, muscle control and morale. Today we understand why. When riding, the human’s pelvis moves back and forth similar to the way it does when crawling or walking. Riding helps develop the muscles needed for walking. Riding provides physical therapy and motivation that is unmatched in preparing a disabled child to someday walk. The horse has also been helpful in breaking through the mysterious veil of autism. Children who have been completely uncommunicative with the world around them for years have responded to the experience of being placed on the back of a gentle therapy horse. Worldwide, organized therapeutic riding got its start after Denmark’s Liz Hartel won a silver medal for dressage in the 1952 Helsinki Olympics. Although afflicted with polio, Hartel had rehabilitated herself from wheelchair to horseback and gone on to riding excellence. By 1969, an organization known as the North American Riding for the Handicapped Association, or NARHA, had been formed. There is no more respected and beloved organization in America’s horse industry today than NARHA and its hundreds of local chapters. Corporations, clinicians and the general public support them generously. It would not be fair to claim that the revolution in horsemanship is responsible for the rise of modern therapeutic riding. They have developed on parallel tracks over the past three decades, yet they are highly compatible and complimentary pursuits. The primary difference is one of emphasis. With therapeutic riding, improving the human is the end goal. With natural horsemanship, developing a partnership between horse and human is the end goal, and improving the human is a means of reaching that goal. Horsemanship and rehabilitation intersect most dramatically in the mustang-gentling programs implemented by numerous prisons in America. The Comstock Wild Horse Program mentioned earlier is one example. The Hutchinson Correctional Facility Wild Horse Program in Hutchinson, Kansas is another. This program’s motto, “Saving Horses – Changing Men,” says it all. To participate in this program of gentling and preparing wild horses for auction, an inmate must put pride and ego aside. He must learn to control his emotions and his behavior. He must work towards a long-term goal and delay his gratification. For an inmate, the horse may represent the first totally honest relationship in his life. The horse does not lie. There is no ulterior motive in the horse’s behavior. To be successful, the inmate must be observant, look for the smallest change and reward it. He must prepare in advance, think ahead, and he must provide rest and reward. Most of all he must develop empathy, the ability to see the world through another individual’s eyes, an ability many in the correctional system have never developed. As the inmate learns how to develop the trust of a wild horse, he also comes to trust that there is a better path for his own life. The revolution in horsemanship is a revolution in relationships. Between horses and people and the world in which they live. Impatience is a very common human trait today. In our busy lives, we are accustomed to looking for fast-acting medications, timesaving products and quick-start solutions. There is an insidious, unspoken assumption in most of what we do that this moment is not worth savoring, that we should rush through it to get to some more worthy moment that we can and should savor. The problem for many of us is that we never get to those truly worthwhile moments. Life is what happens to us while we are waiting for it to begin. Precious few of us can ever completely dismiss the element of time from our lives. But we can certainly reduce our fixation on it. In doing so, maybe we stop rushing quite so much. Maybe we think about what we are doing right now instead of what we need to do next. Maybe we find joy in the living of life instead of just getting to the finish line. Maybe we learn how to enjoy the journey. If so, we have the horse to thank for that. So there you have it: a revolution in horsemanship. This revolution has certainly made it easier and safer and more enjoyable for humans to interact with horses for recreational purposes. In our busy, stressful lives, that would be enough to make it a significant historical event. But we’ve seen that there is something much more profound going on. More than just the quality of our recreation, this revolution has improved the quality of our lives. It has shown us that the human being – every human being – has so much farther he can go in his growth. It has challenged us to try harder, to think more clearly and to be more fully realized human beings, more of what was clearly intended for this species. The horse is the antithesis of the human being. It is the ultimate prey to our ultimate predator. There could be no more incompatible pairing of species on the planet. And yet, we have found that, when given the chance, the horse completes us. It is the day to our night, the hot to our cold, the light to our dark. In terms our eastern brethren understand better than we do, the horse is the yin to our yang. Perhaps this is the reason that this revolution occurred. To hand us a powerful tool for developing the rest of our humanity, the part that wasn’t genetically endowed, the part that, in fact, goes against our genetically endowed, predatory instincts. The part we have to work to obtain and is therefore most valuable to us. Who among us would not agree that the world would be a better place if our leadership was benevolent, our purposes clear, our intentions honorable, our behavior consistent and our relationships empathetic? This has been the message of countless religious and social leaders throughout history, and now it comes to us again carried by an equine messenger, a former beast of burden that is otherwise irrelevant to modern life. It would not be the first time that important truths were delivered by an inauspicious messenger. The horse was on its way to becoming an historical curiosity, something we read about in history books or saw only in zoos. But it came back in a wholly different way than ever before. Maybe it came back to save us. We all know that there is something different and special about horses. But perhaps it is really that there is something different and special about us when we’re with them. We recognize in the horse a means to reach our highest calling as humans. 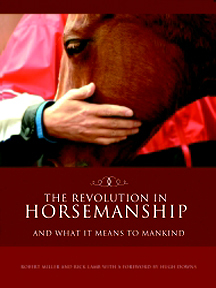 Perhaps that is the real importance of this revolution in horsemanship.